It was a full on show at Marvel Studio’s Hall H, this Saturday at Comic-Con. A lot was unveiled, a lot of great actors and actresses talked about their respective projects and a lot of excitement was in the air. One of the highlights during the afternoon was the “Doctor Strange” panel. Along side the neurosurgeon-turned-Sorcerer Supreme himself, Benedict Cumberbatch, were fellow castmates Benedict Cumberbatch, Tilda Swinton, Chiwetel Ejiofor, and Benedict Wong. Starting off the panel, fans got to see the newly released trailer as well as a lengthy scene in which Cumberbatch’s Stephen Strange met The Ancient One (Tilda Swinton) for the first time. The footage was greeted with a standing ovation. After the presentation of the footage, cast members briefly talked of how their characters would be portrayed in the movie. Rachel confirmed, as fans were wondering after having seen the trailer, that her character, Christine Palmer, had been “friendly” with Stephen Strange at some point in the movie’s story-line. After the panels, Brie Larson was officially announced as the new Captain Marvel and she, along with several other actresses playing roles in the Marvel Universe, posed for a real girl-power photo. 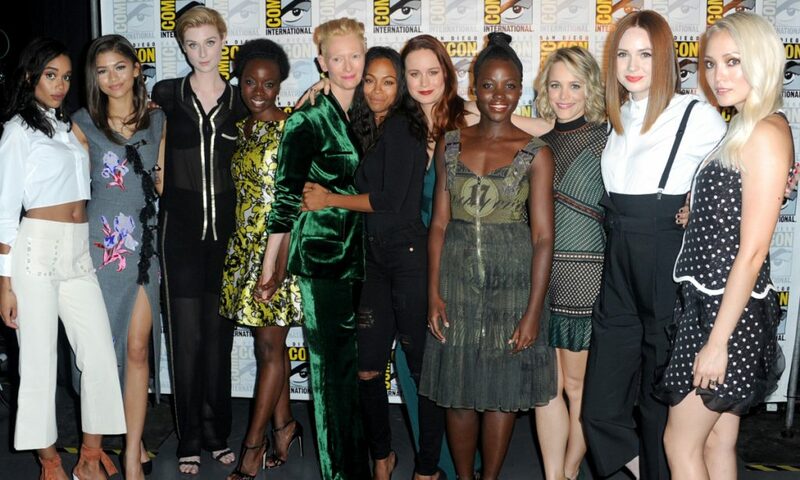 Left to right: Laura Harrier, Zendaya, Elizabeth Debicki, Danai Gurira, Tilda Swinton, Zoe Saldana, Brie Larson, Lupita Nyong’o, Rachel McAdams, Karen Gillan and Pom Klementieff. Be sure to check out “Doctor Strange” when it premieres on November 4th, 2016 (U.S.)! Previous article“Doctor Strange” – Second Official Trailer Out!